We walked into Via 313 pizza and ordered The Detroiter (my mouth is watering just thinking about this). It came to our table and my editor picked up a slice. Without knowing exactly how to dial the settings in, I took the picture. Via 313 reached out wanting to repost it. Sure! A month later, Pizza on instagram used it along with some other pizza-only channels. I felt like I was a rookie baseball player that just hit a homerun during his first at bat. I searched for the image when writing this and look what I found. 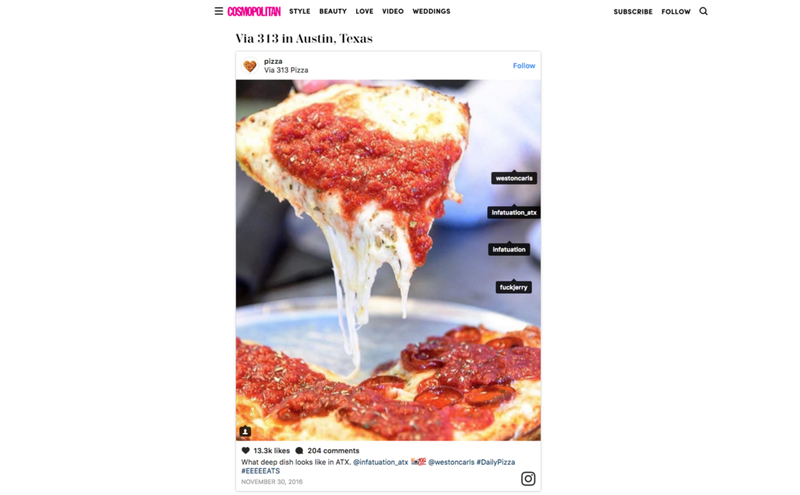 It's an article about The 27 Most Instagram-Worthy Pizzas in the United States. Fourth one down the list (and has the most engagement of them all).